The court heard how the charges related to when he was setting up his constituency office following the 2015 general election. The MP for Brecon and Radnorshire will be sentenced at the crown court. 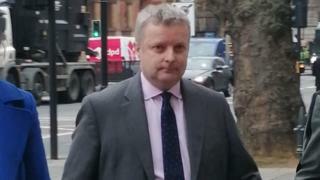 Davies, 51, appeared at Westminster Magistrates' Court on Friday, where District Judge John Zani said he did not consider his sentencing powers to be sufficient. Two offences of forgery were dropped. The court heard Davies had contacted a photographer in Brecon and purchased nine images from him to decorate and display in his constituency office - using his own money to pay the £700 for them initially. But Philip Stott, prosecuting, revealed Davies found in February 2016 that only £476.02 was left in the Start Up Costs Budget, with £8,303.75 remaining in the other. The court heard he could have claimed the full amount from the budget with the larger amount available or had the photographer create new legitimate invoices to split the cost that way. Mr Stott highlighted in a letter to the party investigating officer sent in February 2018, in which he responded to the allegations against him, that he had been "told in a conversation by a more experienced MP that you could 'split' expenses" and therefore attempted to do so. This is the first prosecution of its kind under the Parliamentary Standards Act. Thomas Forster, defending, said this was a "disastrous accounting episode" and added that Davies was the "author of his own misfortune." He argued the expenses system was not an "easy" one to understand and claimed Davies was "not motivated" by "personal gain". Mr Forster said his client was a "family man" with two children who was local to his constituency. District Judge Zani said he noted that Davies was a man of good character who has shown "considerable remorse" and how there was no financial gain for actions. He said as an MP, a position of considerable responsibility and trust, there was a need to be "meticulous in your claims". A Welsh Liberal Democrat spokesman said Davies should resign, adding: "Representing his constituents in these circumstances is untenable. "Brecon and Radnorshire deserves better from its MP." He served as a councillor in Powys before he was elected as MP for Brecon and Radnorshire at the 2015 general election, beating incumbent Liberal Democrat Roger Williams with the seat's largest majority since 1983.